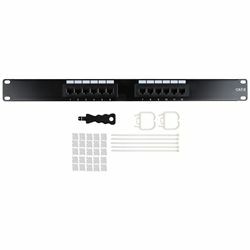 This 12-position CAT6 patch panel features top-entry punch blocks for easy cable management. This 1U 19" panel is UL listed and certified, featuring 110D connectors, and can be used with both T568A and T568B-type installations. Includes punch tool, block covers, 2 cable managers and zip ties. Rackmount hardware not included.